Aisha Bowe has enjoyed a meteoric rise from mediocre student to her dream job at NASA to CEO of a successful business. The D.C. resident's long, winding road there is the stuff of black history. During Black History Month, WTOP is highlighting black men and women in the area who are doing groundbreaking work to better the community. This is Part II of a four-part series. WASHINGTON — In recent years it was estimated that only 10 percent of aerospace engineers are women, and black women account for only one in tens of thousands in the field. 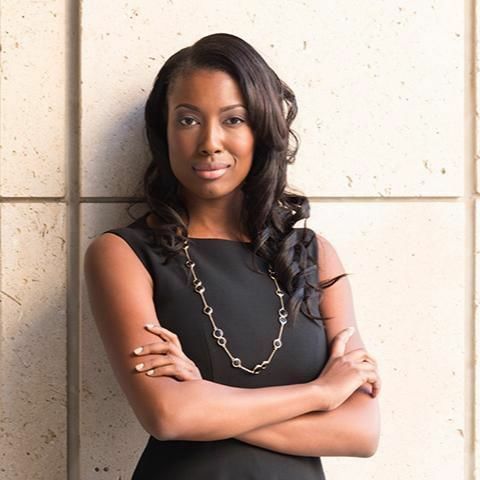 Aisha Bowe beat the odds to not only have a standout career as an aerospace engineer at NASA, but even now as the CEO and founder of STEMBoard, a multi-million dollar, wholly-owned and self-funded business headquartered in Arlington, Virginia. Bowe achieved all that before the age of 30, and her story has led her to become a motivational speaker of sorts. Her advice for others seeking the same level of success may be simple — “Stick to your script. Trust your gut.” — but her long, winding route to becoming a thriving entrepreneur is best defined by others recognizing her potential — and Bowe learning to see it in herself. Bowe, 33, now lives in Northwest D.C. but grew up in Ann Arbor, Michigan. Her parents divorced when she was a kid, and that led to self-esteem and scholastic issues, she said. She didn’t have the grades to go to a top university, so she attended community college with a focus on international business. But all that changed when a teacher challenged her to think about what she wants out of life. “It was there that I began to realize that at my age, I had no self-confidence and I didn’t have any direction,” Bowe said. From community college, Bowe transferred to the aerospace engineering program at Michigan with the goal of working at NASA. Through a joint program there, a mentor offered her a job at NASA Ames in Mountain View, California. Initially, she turned it down. Bowe pointed out that NASA’s predecessor, NACA, is where the ladies featured in the based-on-a-true-story film “Hidden Figures” — Katherine Johnson, Dorothy Vaughan and Mary Jackson — worked. In her six years at NASA, Bowe said she took in all she could, walking around the facility, traveling to other NASA centers, and asking everyone what they do. She said she loved the challenge of facing “problems that had never been solved before,” and especially thrilled to meet Nichelle Nicols, the iconic actress who played Lt. Uhura on the original Star Trek TV show. While in the Bay Area at NASA, Bowe had interactions with groups focused on minorities in engineering. Bowe started doing tour groups for kids, and saw the impact on them and how it increased the number of kids getting into the field. “The more that I was in contact with that, the more I wanted to understand: How could I have that experience and also feed my curiosity for technology?” Bowe said. That, and being right there in Silicon Valley, is how the idea for STEMBoard took root. Bowe was comfortable in her dream job with benefits at NASA, so again, it took a mentor to talk her into believing in herself enough to really explore entrepreneurship. “The mission is to develop technologies that advance our nation and our citizens, but we do it for social benefit,” Bowe said of her company of 26 people and growing. Bowe said her program, which debuted in the Caribbean and reached to California and now the D.C. area, encourages youth to take everyday problems and come up with practical solutions, citing the example of one student who came up with a sensor-based temperature regulating shower head because his little brother kept burning himself in the shower. STEMBoard also does engineering consulting, but Bowe says outreach remains the company’s bedrock. Bowe said the program looks to continue its community engagement through students who have already come up through the program. “What ends up happening is, our students come and they give back and they help us do more community engagement, more outreach, more content and it’s been something that started out as a passion project and it’s just growing rapidly,” Bowe said. Bowe’s success hasn’t just garnered attention in D.C. and her native Michigan. Word of her meteoric rise has apparently reached grade schools in Georgia. A middle school student named Avery reached out to Bowe for a Black History Month school project, and even in recounting the phone conversation, Bowe was still floored by the attention from the confident youngster.